In 1857, Central Park was carved out of the still-wild landscape of Manhattan. In 2013, a new park in the middle of super-dense New Delhi is poised to dwarf Central Park by almost 50 percent. But how will they build a 1,200-square-foot park smack dab in the center of the fourth biggest city in the world? That's the dilemma. The Aga Khan Trust for Culture plans to knit together several different adjacent sites, like the Sunder Nursery, Humayun's Tomb, nearby gardens, heritage areas, and an old zoo. 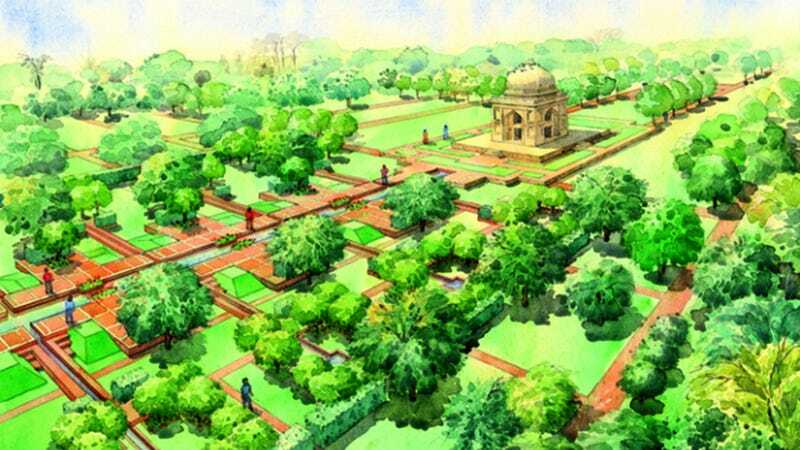 The group also wants to carve out a lake and create a Mughal garden in the lush urban oasis. Alright, stitching together some adjoining green spaces isn't that bad. So what exactly is the problem? Well, first of all, no formal proposal has been filed. Secondly, and perhaps more importantly, there's a lot of bureaucratic red tape when it comes to getting the rights to the land. For example, the tomb is controlled by the Archaeological Survey of India. The Delhi Public Works Commission runs the nursery. And the Ministry of Environment handles the zoo. Those are just three pieces to a very large puzzle. But the Trust and its director, Ratish Nanda, say they're committed to leading the charge.